$1.00/hour beginning 7:00am on Mondays through 7:00pm on Fridays, excluding holidays. $2.00/hour beginning 7:00pm on Fridays through 7:00am on Mondays. On any Holiday $2.00/hour from 12:00 midnight at the beginning of the Holiday through the next 24 hour period. Parking is available along the ocean front beginning with Parking Lot #1 between Farragut and Stockton Ave. Lot #1 is equipped with pay stations that accept coins, bills and credit cards. Lots 2 and 3 have meters which accept coins only. All lots are closed between 2 AM and 6 AM. There is also some meter parking available on the ocean blocks of Porter, Farragut, Stockton, Decatur, Lafayette and “O.” A metered area is also available on North West Central. Please obey head-in parking only decals. If a snow emergency is declared, you must remove your vehicles from the street so that the snow can be plowed. This is a Borough Ordinance. Snow emergencies are announced on radio stations such as W-OBM 92.7 FM, on the web at sites such as www.shorestormwatch.com, or you can contact the Police Department at (732) 793-8000. The Lieutenant may issue a temporary handicapped parking permit to a Seaside Park resident. The temporary permit is valid for 6 months. The temporary handicapped permit is intended for people with temporary physical conditions. You can get the application form for a temporary handicapped permit through the Seaside Park Police Department or the NJ Motor Vehicle Services. Your doctor may also have an application. The application requires that your doctor signs the application, and a $4.00 check payable to the NJ Motor Vehicle Services be included. 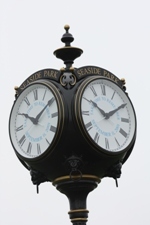 The application and fee is submitted to the Seaside Park Police Department, and you pick up your temporary permit from the Police Department. The handicapped person may request an extension after the first six months if they have not yet recovered from their handicapped condition. The NJ Motor Vehicle Services issues permanent handicapped parking permits. Applications for permanent permits may be picked up at the nearest NJ Motor Vehicle Services Office. You send the application and payment directly to NJ Motor Vehicle Services by the applicant. If you wish for a form to be mailed to you, you can call the Motor Vehicles to request it. The phone number is 1(888)486-3339, x5061. You may request either a placard, a special license plate, or BOTH. (There is no charge for this.) You’ll need your doctor’s permission, and the process takes between 4-6 weeks.